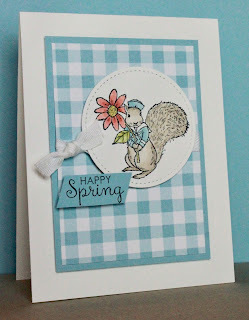 Just Julie B's Stampin' Space: Creation Station Blog Hop - Going Gingham Style! 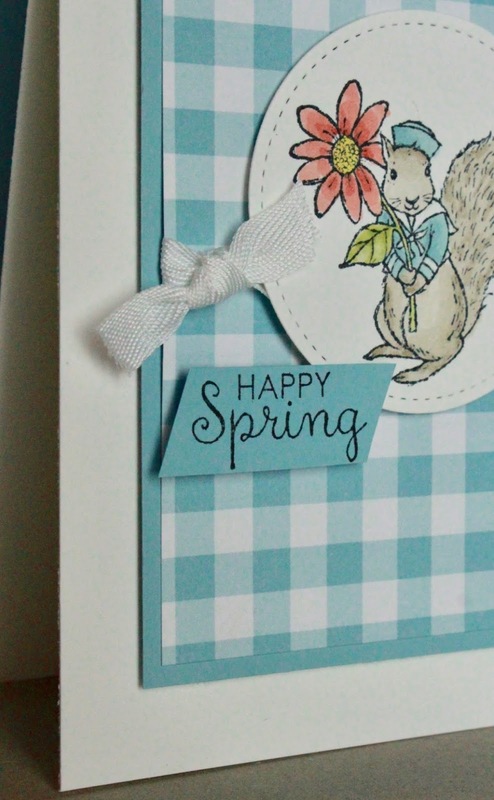 Creation Station Blog Hop - Going Gingham Style! OK - so back to card making! When I saw all the gingham papers - and fell in love with them... I wasn't so sure that I had to have them just to go with the Butterfly Gala, all part of the suite. So I bought the papers first. I Love all the animals in the Fable Friends set - the bunny and the ducks, and baby ducks... but this little squirrel guy - he stole my heart! He's just so cute!! 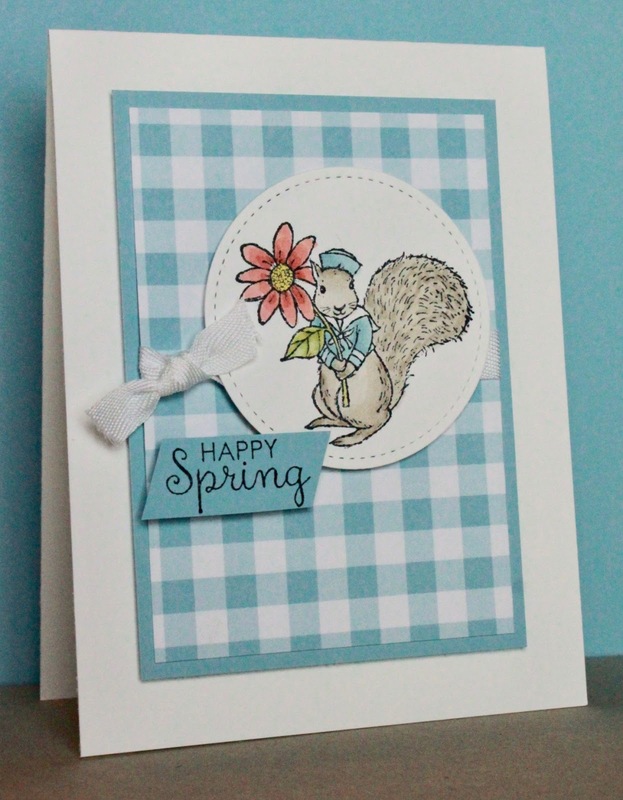 I couldn't wait to color him with some Stampin' Blends and put him on a card, Haha! Look at him a little closer, with the sweet little sailor jacket and hat - so cute, right?! 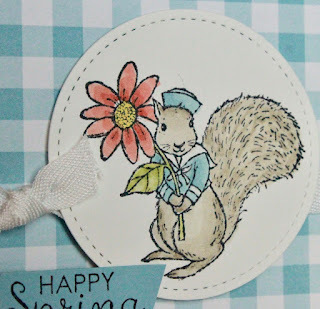 I loved coloring him with the Stampin' Blends - I used Crumb Cake, Balmy Blue, Calypso Coral and Old Olive and a smidge of Mango for the flower center. With more practice, I'm really liking the Stampin' Blends more and more!! 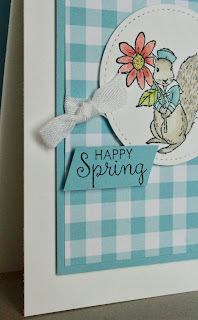 I added a little "Happy Spring" tag, quickly (and not perfectly) cut from Balmy Blue Cardstock, just to give a nice general saying on the card. I kept all the other details of the card simple - one layer of Balmy Blue underneath the gingham and just a simple knotted Whisper White Classic Weave Ribbon - all because I wanted to be a 'boy' card for my grandson! I try to visit him often, and usually bring him a little something. So next time I visit, I figured I would add this cute little card to his little gift! I hope you enjoyed your stop here! And I hope you enjoy your hop to the amazing Denita Wright-Smee! Can't wait to see what she has created! 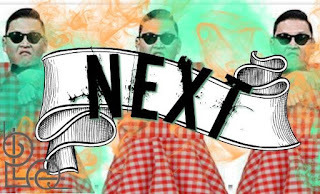 Click the link below to continue on the hop! Oooh, I love your card! You've convinced me--I am ordering Fabled Friends today. Your squirrel is perfect with the gingham and perfect for your grandson.